The main purpose of the Conway Club is to maintain and foster social relationship between former Cadets of the Ship and the Conway shore establishment. The following descriptions are the best information available at present. Conway adopted its first badge in 1859. It is shown on the right. This seems to have survived until the formation of the Club in 1910. The Club quickly adopted its own badge and I assume that the Conway and Club badges existed in parallel for many years. At some point (perhaps version 3 below) the two badges must have merged. There have been several versions of the Club badge over the years. - The original badge (version1 below) adopted when the Club was formed in 1910 featured the letters CC i.e. Conway Club. - In 1925 these were changed to OC i.e. Old Conway. - The badge was later changed to that familiar to us today; the Ship surrounded by a golden laurel wreath, surmounted by the red castle and with the motto hand written in black on a golden scroll below. The first example of this (version 3 of which I have no example (yet!)) included a very detailed rigging. At some point it was changed again. - Version 4 appears similar but was actually quite different. The hull of the Ship was rather stylised and the rigging was virtually nonexistent. A red badge shape was added around the rest of the crest. The wreath became red, the scroll white and the motto red. The castle was not centred properly. - Version 5 in use to this day, reverted to the colours and style of version 3 except that the rigging was greatly simplified. The motto was still handwritten but was written anew. The observant may have spotted that the crest on the cover of the new history of the ship has been rewritten again in printed text rather than hand-written text. Larger versions are in the Crests Badges & Ensigns album. If you have better information please email me. 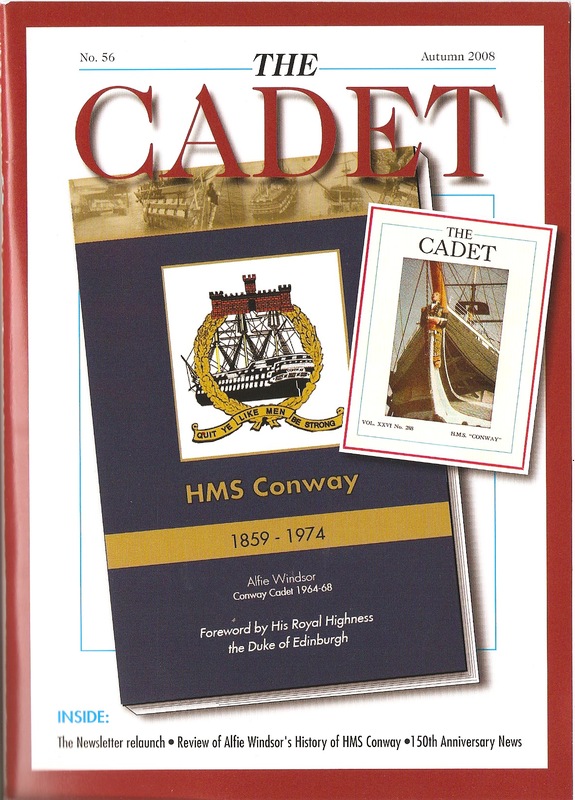 Membership of the Club is open to all Cadets who served in the HMS Conway school training ship and are known as Old Conways, providing they completed a full course of training. It is to be hoped that this Website will encourage those Old Conways who have never belonged to join, or who have ceased to belong to rejoin, the Club. Provision is also made in the Club Rules for Honorary membership of the Club, for those who have at any time been closely associated with the Conway or with members of the Club. Membership subscription is GBP15 for full life or GBP5 annually, payable to the Hon. Treasurer on 1st January each year. Please print, complete and post the Application Form (Word document) from this page. The Club's Officers and Committee are chosen from members of the Club and is limited in number to 24, elected annually at the AGM. The newsletter has been rebranded as The Cadet and caries echoes of the original format. It is published twice a year in Spring and Summer. It is full of information on social events, news on the activities of Old Conways around the world and graphic reports from the personal history of Old Conways. but contributions received after those dates will be included if possible. This major function usually takes place with the AGM, alternately in the North and South of the UK in October. Please refer to the Diary for full details of the current and forthcoming year's Annual Dinners. This usually takes place on the first Thursday in June at a venue overlooking the Thames commencing at 1830, and is well attended by Old Conways and their guests from near and far. Details of the next event are in the Diary. Most Branches in the UK and overseas hold annual dinners and other functions on a regular basis. Please consult the Diary for details. AGMs are held annually in October. Full details are posted on the Diary page. The Conway Club has branches throughout the world established for the furtherance of social contact. They operate as independent organisations and there is no structural, legal or financial linkage between individual branches and the Conway Club e.g. the Conway Club Committee listed above has no organisational control over branches. Some are "joint" branches with members from Conway, Worcester, Pangbourne (CWP) and General Botha. Each branch is run by a dedicated group of volunteers who give freely of their time and energies to keep Conway chums in contact and the name of Conway alive. Wherever you are in the world you are encouraged to contact your local branch and join the local group. Contact can be made through the individual listed below. . If your Branch isn't listed, take up your pen (or keyboard) and contact us to ensure that you are included in the next update of this website. Please provide details of the Branch Secretary's address, ideally an email address and a phone number that the Secretary is prepared to have broadcast on the website, and a note of planned activities and social events.